Filled with holiday cheer and bright color, this handmade charm necklace is designed with a cranberry red soft lucite Christmas bulb charm that has been combined with a shimmering clear glass crystal and a genuine fresh water pearl charm. Bulb charm measures 28mm in length. 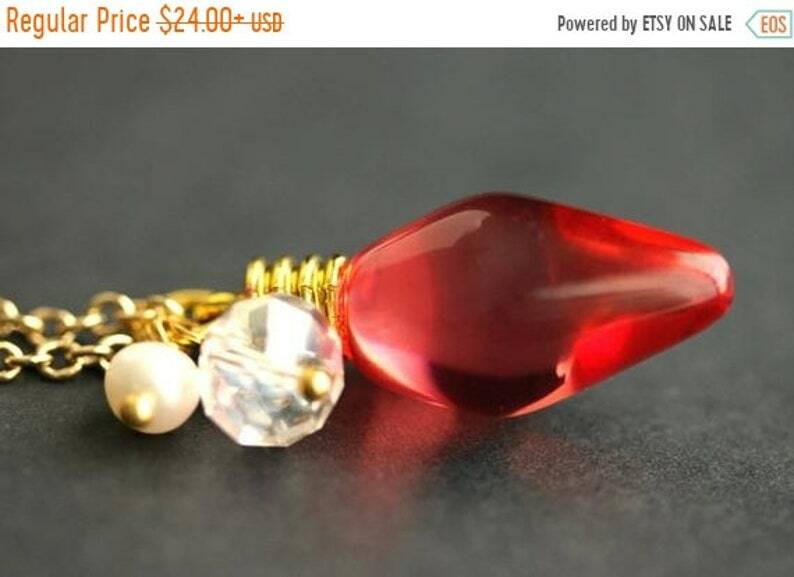 EASTER SALE Red Christmas Necklace. Christmas Ornament Necklace with Crystal and Pearl Cluster. Handmade Christmas Jewelry. EASTER SALE Cranberry Acorn Necklace. Crystal Acorn Necklace. Acorn Charm Necklace in Bronze. Handmade Jewelry. Gingerbread Man Earrings. Christmas Cookie Earrings. Holiday Jewelry. Xmas Earrings. Christmas Earrings. Stud Earrings. Post Earrings. Golden Bell Christmas Earrings. Green and Gold Earrings. Gold Bell Earrings. Holiday Earrings. Gold Post Earrings. Christmas Jewelry. Snowflake Earrings No.7 - White Snow Earrings with Silver Stud Earring Backs. Winter Earrings. Handmade Jewelry. Snowflake Earrings No.2 - White Snow Earrings with Silver Stud Earring Backs. Winter Earrings. Handmade Jewelry. EASTER SALE Poinsettia Flower Ring. Christmas Ring. Rhinestone and Resin Poinsettia Ring. Silver Plated Adjustable Ring. Christmas Jewelry. EASTER SALE Kangaroo Charm Necklace in Bronze with Amber Crystal and Pearl. Handmade Jewelry. Snowflake Earrings No.6 - White Snow Earrings with Silver Stud Earring Backs. Winter Earrings. Handmade Jewelry.